Wow! 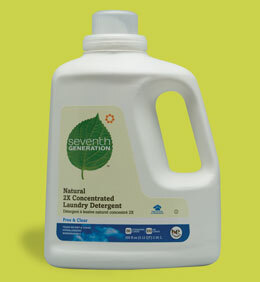 Seventh Generation Cleaning products are wonderful! They have a wide variety of cleaning products and they are all "green" and eco-friendly. For my review I received the Free and Clear starter kit, and it is amazing! -From the Great Law of The Iroquois Confederacy. The Free & Clear Starter Kit is packed full of goodies and they are all so useful! We had a chance to use all of the products, and let me say, our house us looking good! We started with the Natural Glass and Surface Cleaner. The glass and surface cleaner is Non-Toxic (which is very good for me because we have lots of pets!) it leaves no streaks and the scent is very light, so you don't get sick or dizzy. The tops of our cabinets usually get very dusty and sometimes they even get sticky. Normally it takes alot of work anod scrubbing to get the "goo" off well the Seventh Generation Natural Glass and Surface Cleaner actually saturated and soaked in, loosening the dirt and so when I would wipe it would come right off. Then we tried out the Multi-Surface Cleaner and it was also a wonderful product. It kills 99.99% of germs. With the beautiful scent of Lemongrass and Thyme you can't go wrong. Normally chemicals are nasty smelling and harsh, but the Multi Surface cleaner is so refreshing. We love to use this outside on the lanai table because we have a glass table top and the cats are always jumping on it. So if we have an outdoor cookout we can simply spray and lay :). Next, theres the 35 count Disinfecting Wipes with Lemongrass and Thyme scent. The wipes are so handy! There in an easy flip top lid, so when you need a wipe all you do is pop it open. 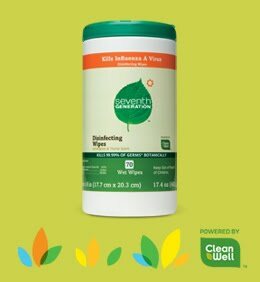 The Disinfecting wipes are perfect for quick cleaning. It removes dirt fast and is 99.99% effect, so no worries! 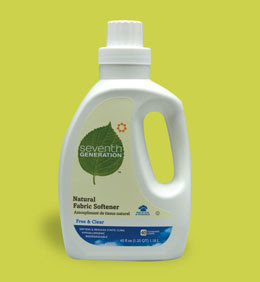 Having a giant family like ours, there is always a mess, and the Seventh Generation Disinfecting wipes are a quick fix! 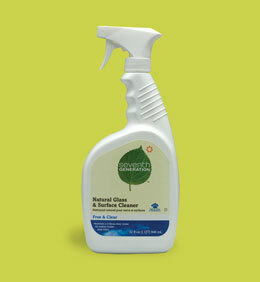 The Free & Clear Natural All Purpose Cleaner is another great one. like the other Free & Clear products this one is Non-Toxic and completly free of dyes and fragrances. So it's safe to use anywhere! Get this! ( and of course I hope this would never happen! ) 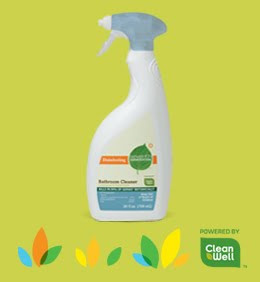 If you happen to swallow the Free & Clear All purpose cleaner then no worry, it's not poisinous! Of course it won't taste very good, but all you NEED to do is drink lots of water, and it is of course, recommended to consult your physician. We used out All Purpose Cleaner the floors. All you have to do is add 2-4 oz of cleaner and your ready to mop! The Natural All Purpose cleaner made our floors shine and woo, let me tell you, I was proud. I made them look so shiny :). 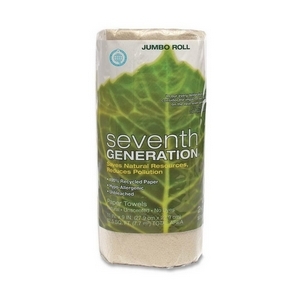 The Seventh Generation Natural Fabric Softner is wonderful. Even though the bottle looks super tiny (40 oz) it still actually cleans 40 loads of laundry. I know this bottle is going to last a while, and I'm glad because I love the way it makes my clothes feel. After my wash (and dry of course lol) I took them out and they felt so soft! That is not the only benefit of the Seventh Generation Fabric Softner, the other important key features are: Reduces Static Cling, It's Hypoallergenic (Big +! ) and it's biodegradable! Now that is a fabric softner! For $5.99 you can't go wrong! Think how beneficial the Free & Clear Natural Fabric Softner is! The Disinfecting Bathroom Cleaner is a life saver! My cousins girlfriend was coming over and she lives about 3 miles away, so I had to do a super quick clean up. Since we have white tiles it tracks easily, and gets dirty fairly fast. With the Bathroom Cleaner all I had to do was spray and wipe. Simple huh? In seconds my bathroom had a spotless floor :). Then there is the Natural Laundry detergent. 2 Words- Loved it. The Laundry Detergent is 2x concentrated. If every household in the United States replaced one of their normal detergents with the Seventh Generation Laundry Detergent we could save 150,000 Barrels of oil! That is ALOT of oil! 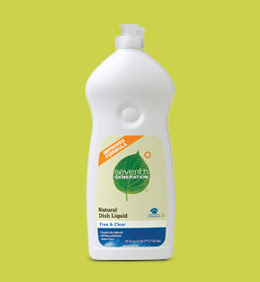 The Natural 2X Concentrated Laundry detergent is tough on dirt and stains, hypoallergenic and biodegradeable! Now that's a good detergent! 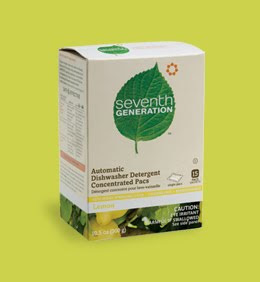 Next: The Seventh Generation Automatic Dishwasher Detergent Concentrated Pacs. The box comes with 15 pacs and they really work! When it comes to my dishes I am very very picky. Alot of dishwasher detergents will leave residue, but I am glad to say, the concentrated packs do not! The leave my dishes looking brand new :D! Next is my favorite. The Free & Clear Dishwashing Soap. What I looove about the Dish Liquid is that it is really thick! Most Dish Liquids are runny and evaporate into the water before they even get the chance to soak. Well the Seventh Generation Dish Liquid is heavy duty. It's tough on grease, hypoallergenic AND Non-toxic. And considering that this goes on your dishs, that is very important. And here is the most important thing. NOT TESTED ON ANIMALS. This 25 oz bottle is the best dish detergent I have ever used, and I wouldn't even consider switching back to my old one. Then the Seventh Generation Jumbo Roll of Paper Towels. Normally paper towels seem to rip for me, but I used these to dry my rat cages last night and 1 sheet dried 2 cages! I was very impressed! No rips, the paper towel didn't start falling apart. Some of the great features are: 100% recycled paper, hypo-allergenic and they are unbleached. 933,000 Trees, 2.4 Million cubic feet of landfill space (or 3,700 full garbage trucks!) 350 Million gallons of water and we would avoid 59,600 TONS of emissions. WOW! And finally.. The cherry on top; The Seventh Generation Reusable bag that was provided with all Free & Clear kit. The green bag has the Seventh Generation Logo on it and is very heavy duty. I can proudly say I will never use a plastic store bag again :). These are wonderful products and thanks to Seventh Generation I feel like I am doing just a little bit more for the world. All of the Seventh Generation products are amazing, and I am so happy I got to try them out! Just think, if me and all of you (my wonderful blog friends :)!) made this small change we could really make a huge impact. Remember, One person makes a difference. 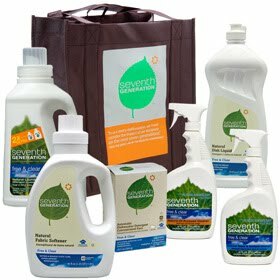 A GIANT Thank you to Seventh Generation for providing me with a Free & Clear starter kit upon my request. The wonderful people from Seventh Generation are letting me give 1 of you the same kit I got. Which is the Free & Clear Starter kit that includes: 1 Reusable bag, 1 Bottle of Natural Dish Liquid, 1 Jumbo roll of Natural Paper Towels, 1 bottle of Concentrated Laundry Detergent, 1 bottle of fabric softner, 1 bottle of All Purpose Cleaner, 1 Bottle of Glass and Surface Cleaner, 1 Box of Automatic Dishwasher Detergent Pacs, 1 bottle of Multi-Surface Disinfectant, 1 bottle of Bathroom Disinfectant and 1 package of Disinfecting Surface Wipes. This Giveaway was extended until June 25th! I subscribed and I would love to try this product. I signed up for the newsletters via email. I signed up for the Seventh Generation Newsletter. i get the 7th gen newsletter! I signed up for the Seventh Generation newsletter! -I Subscribe to your blog by email! -I Follow Seventh Generation on Twitter @vmsweet123 my user name! Signed up for 7th generation newsletter under romapup at gmail dot com. Thanks! I entered the $100 American Express Giftcard! Signed up for Seventh Generation's newsletter. Following Seventh Generation on twitter. Like Seventh Generation on Facebook. Entered the $100 American Express Gift Card Giveaway! Entered the Gourmet Giftbasket giveaway. I signed up for the seventh gneration newsletter! I follow seventh generation on twitter! I like seventh generation on FB! What a great giveaway. I've always wanted to try Seventh Generation products, guess this would be the best chance ever. I signed up for the newsletter! I subscribe via email to My Life with Rats and More blog. I entered the KinderGlo Night Lights giveaway.